More than 40% of teachers are hesitant to even teach about the election. As the Spring wore on, reports in the Huffington Post and The Washington Post reported on the Trump Effect: increased bullying, hate language, and loss of civil discourse in schools. At a high school basketball game in Indiana in March, students chanted “Build the wall!” at the opposing team, which was made mostly of Latino players. In Fairfax County, Virginia, a third-grader was singled out by classmates and told that because he had brown skin he would be sent out of the country when Trump is elected. From the moment Trump announced his run for the presidency by equating Mexican immigrants with criminals, students of Mexican descent have felt fear about their futures, and the same is true of Muslim children who heard his repeated pronouncements that he would seek a ban on Muslim immigrants and perhaps even deport others. Soon research organizations like the Cyberbullying Research Center and PolitiFact were reporting that there has indeed been an increase in these negative behaviors by school children, often referencing Donald Trump. The reality for teachers in the last year of this campaign has been one of increased tensions in the classroom and dealing with students who feel empowered to bully and discriminate. This has been especially discouraging in schools that had made significant strides in decreasing bullying over the last several years. The behavior has been especially hard on students of color – most particularly Muslim and Latino students – who have received the brunt of the abuse, and most of that was before women’s body parts became part of the “conversation,” escalating even worse language being used in schools. No matter what happens with the election, there will be lasting consequences of the Trump Effect. Schools and teachers will need to develop strategies to not only de-escalate the increased incidences of bullying and hate language, but also to rebuild environments of kindness, awareness, justice, and equity. Switching Perspective: The number one tool in Conflict Resolution is to give the participants in the conflict the opportunity to experience the other’s point of view and perspective. By stepping into someone else’s shoes, they are able to temporarily suspend their own framing of the situation. This skill is broadly gone from how we teach discourse or how we conduct discussions with our students. But this will be a necessary strategy in dialing back the negative behavior that has emerged due to the Trump Effect. Teachers must be proactive in asking their students to see each other’s points of view. Using role-play or just conversations, teachers can help their students truly change the way they think and consider empathy and compassion when dealing with their peers. Immediate Intervention: Intervening immediately when language or behavior expresses hate, discrimination, or bullying is essential. Teachers cannot stand by when students utter this kind of language in the classroom, or when they observe behavior. Often teachers, feeling burnt out by their working conditions, and like many Americans feeling the stress of this election season, tend to avoid conflict if they can. They may not even realize they are doing it. But it is on us as the adults in the room, and as educators, to be the ones who stop the Trump Effect in its tracks when we see it happening. Reframing: When students seem to be emboldened to name-call, use hate language, or treat their peers with meanness, educators have an opportunity to reframe the situation. One way to look at this is to consider the student’s interests. Interests can be thought of this way: the student’s position (what actions or words are he using?) + asking “why is he behaving that way?” The why could be as simple as the student wants more attention, or perhaps things aren’t going well at home. Add that to the permission a lot of students are feeling to act out negatively, and that combines to create a bad situation. But if you can reframe that why and find a way to meet the student’s interests in new ways, redirecting their position and behavior. Practice Guided Discussion: Guided discussions can be really helpful for your students. It works especially well with controversial issues. Being upfront and courageous about tackling controversial issues with your students within a controlled discussion can have a huge impact in terms of modeling empathy. Give your students a base text to read and set rules for the discussion beforehand about referencing the text – that gives them the ability to share a source even while they may have different opinions. Issues such as immigration, refugees, equal rights, and even this election should not be ignored because they are uncomfortable. But it’s also important to give students factual foundation and interesting text from which they can begin to form critical thoughts and ideas. The more they are challenged to think and discuss these issues, the less they will be inclined to speak or act out of ignorance or assumptions. These are just some of the practices teachers and schools can begin to employ to counter the Trump Effect. 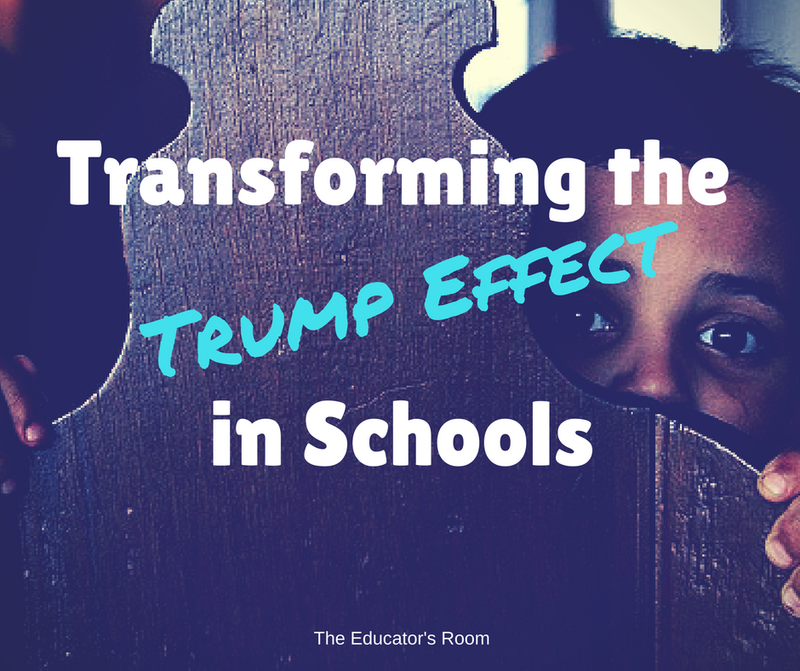 After a year of negativity, discriminatory speech, threats, and scare tactics swirling throughout our national conversation, transformation will need to happen so our students can find their way back from those influences. Educators will once again be the vanguard of positive change in our students’ lives if we can engage them again in habits of civil discourse, empathy, compassion, and critical thinking. Your practical suggestions find me hope that we can do this and do better… Together.